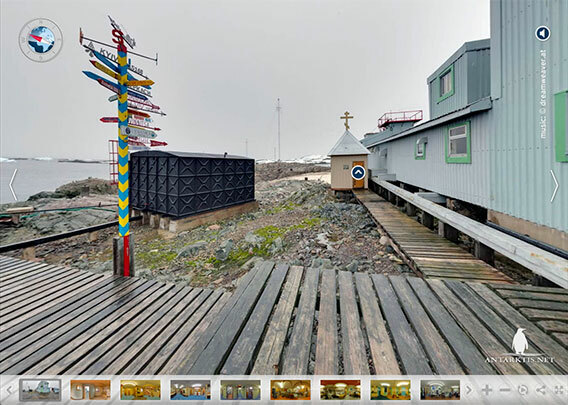 A virtual tour through Vernadsky Station (Argentine Islands). Here you can find the correspondenting travelblog Entry. Have fun looking, we are looking forward to your feedback! 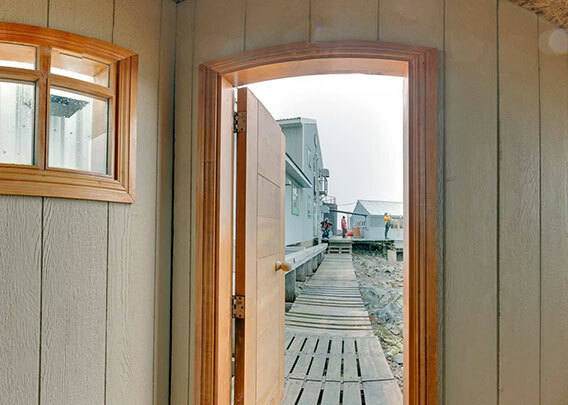 Once you have entered the virtual tour, you can use the bar at the bottom, or click on symbols within the panos to enter the next one (only if the next location is visible, not always available). Or you can just let it run and it will automatically switch to the next pano after one turnaround. You can switch the sound off (upper right corner) if you wish. The Ukranian base Vernadsky is the successor of the British Faraday Base, which was sold to the Ukraine in 1996 for one symbolical pound sterling. Since then, the Vernadsky station is operated year-round by the National Antarctic Scientific Centre. Named after the Ukranian scientist Volodymir (or Vladimir) Vernadsky (1863-1945), it is the oldest scientific base in Antarctica that is still operated today. Historically, its roots are linked to the British Base F (Wordie House). 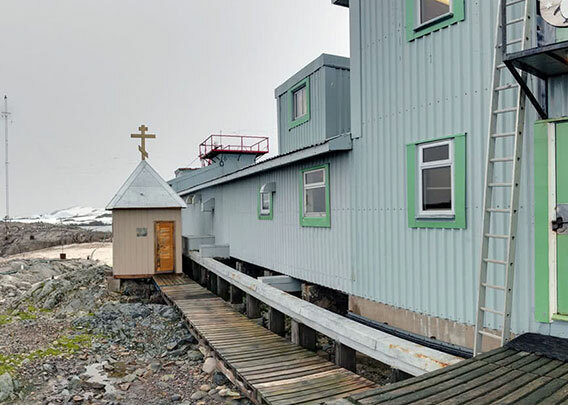 The latest addition to the Vernadsky station is the little chapel, which was built in 2012. This is where you take your shoes off, under supervision of Volodymyr Vernadsky, who is hanging on the wall, keeping a watchful eye on everybody who is coming and going. 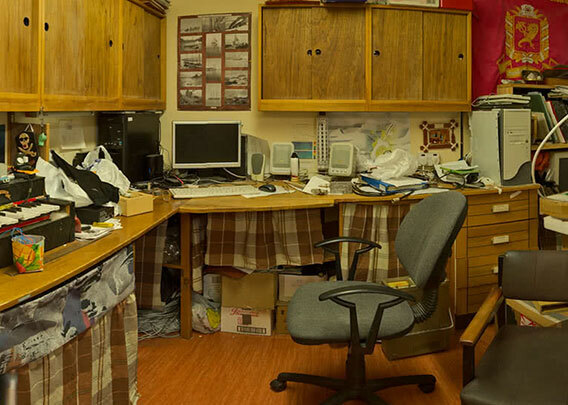 From here, you can either access the working area (3) or go upstairs to the famous Farady Bar (10). 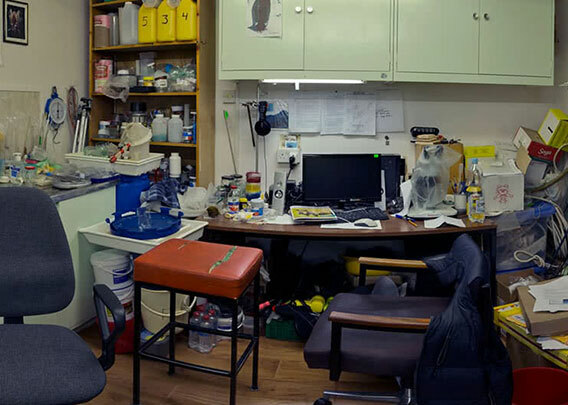 This is where you get to the various laboratories and work rooms. The antarctic main hazards are obviously taken seriously here: there is a lot of firefighting equipment and emergency plans in this area. The dry, windy climate of Antarctica makes fire an everpresent risk. And anyone who leaves the base area has to leave a note about his plans and return times here, so alarm can quickly be raised and search-and-rescue can be started efficiently if needed. 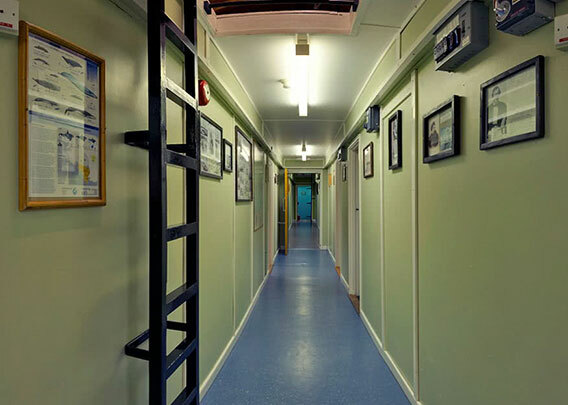 This is how most working areas in antarctic stations look like: long corridors with several doors to the various laboratories and work rooms. 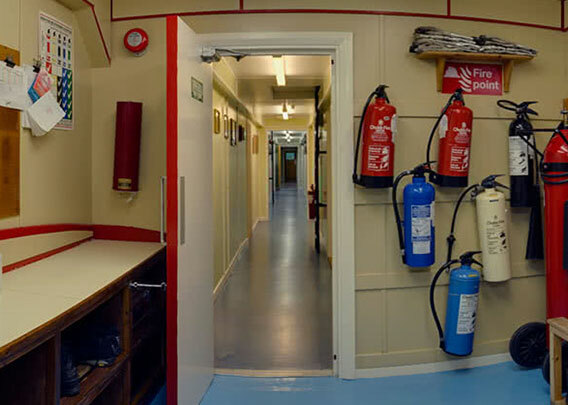 Walls are usually decorated with maps, photos of earlier station crews and historical photos. 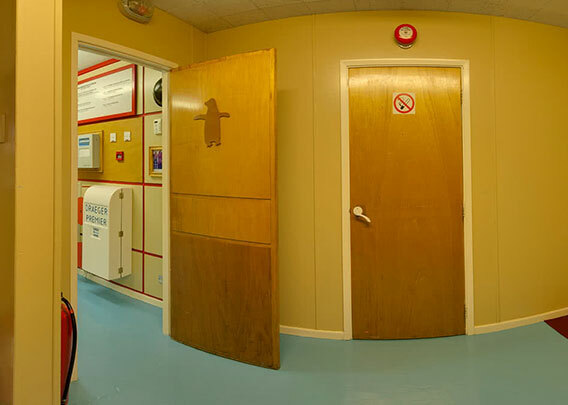 Scientific places in Antarctica (or elsewhere) are visually often less exciting than you might expect. What you will mainly see is computers and a couple of instruments, the meaning of which will only be readily understood by the initiated. The regional geology is subject to ongoing research. The more or less permanent ice cover on land makes geological research very challenging. On the Argentine Islands, where the Vernadsky station is situated, you will find weakly metamorphic volcanic rocks and granitoid rocks dating back into the upper Jurassic and into the Tertiary. The sledges are leftovers from earlier days. Dog sledge journey are history now in Antarctica. A small crew will spend the winter on the Vernadsky station. Even though it is about 140 kilometres north of the antarctic circle, the days are short during the winter and storms can be long and intense. 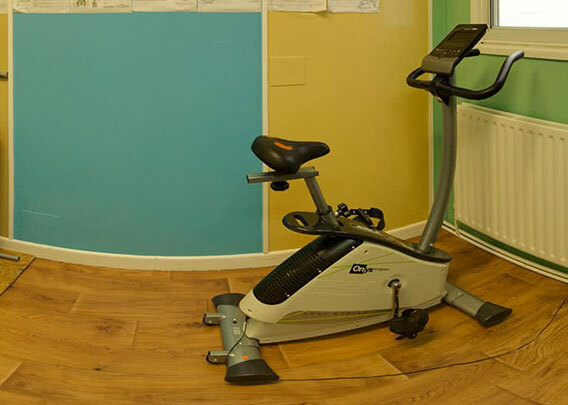 This makes the gym a very important place for the wintering crew. 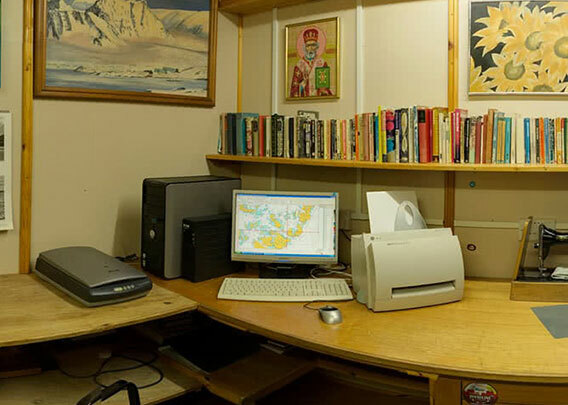 Next to atmospheric sciences (meteorology, ozone) and geophysics (magnetism), it is marine biology that the scientists of Vernadsky base spend a lot of their time with. How do marine organisms adapt to changing climatic parameters such as increasing water temperatures or changing pH-values (acidification of sea water)? On Vernadsky base, the biologists make a contribution to answering these and other questions in a regional context. 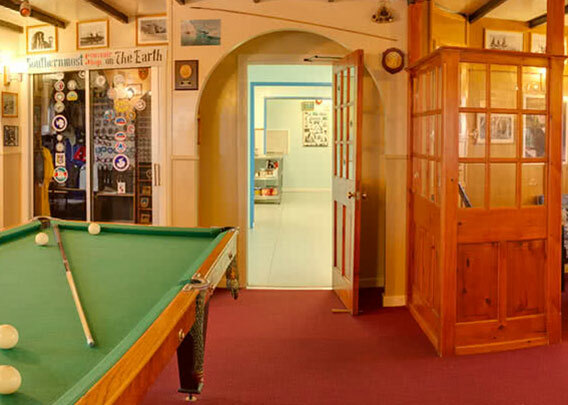 Many visitors to the Vernadsky station will have vivid memories from the Faraday Bar. This is where station visits often have a pretty social ending, which is occasionally said to have blended into a long merry evening. Billard table and guitar are then put to good use. There was a tradition that ladies can trade their bra in for a drink, and there was sometimes an impressive collection on the wall behind the bar towards the end of some successful seasons. The little souvenir shop is usually very popular, and so is the opportunity to send postcards or to get the station stamp in the diary.